As the American Army fought in Iraq and Afghanistan, it became the best tactical level counter insurgency force of the modern era. America’s enemies, however, did not rest. Russia observed the transformation of the American Army and began a transformation of their own. This new military barely resembles its former Soviet self. Wielding a sophisticated blend of Unmanned Aircraft Systems (UAS), electronic warfare (EW) jamming equipment, and long range rocket artillery, it took the Soviet model out of the 1980s and into the 21st Century. Radicalization is the process by which an individual, group, or mass of people undergo a transformation from participating in the political process via legal means to the use or support of violence for political purposes (radicalism). Radicalism includes specific forms, such as terrorism, which is violence against the innocent bystander, or insurgency, which is violence against the state. It does not include legal and/or nonviolent political protest, such as protest that is more properly called activism. U.S. Army Company Intelligence Support Team (CoIST) Reference Card produced by the Asymmetric Warfare Group in December 2010. This guide assists in three areas. First, it aides military leaders and all personnel to be aware of the indicators associated with insider threat activity while serving in a partnering environment. Second, this guide informs commanders and other leaders by giving them options on how to deal with insider threat activities. This guide is not all encompassing so there are other options a commander has dependent on their operating environment. Lastly, this guide is meant to generate open dialogue between coalition partners and partner nation personnel. Partnering in itself is a sensitive mission and only by creating trust and having an open dialogue with all forces will the mission be accomplished. 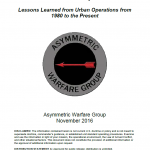 U.S. Army Asymmetric Warfare Group Afghan Key Leader Engagement (KLE) Tactical Pocket Reference from October 2009. This document facilitates discussion, training, and implementation of effective information superiority methods at the Battalion and Brigade level. This paper discusses the Center of Gravity analysis model for identifying threat networks, Critical Capabilities, and Critical Vulnerabilities; use of the methodology to determine the threat vulnerabilities; and as a basis for understanding how to achieve Information Superiority. U.S. Army Asymmetric Warfare Group Sniper Awareness and Counter-Sniper Reference Card from October 2007. 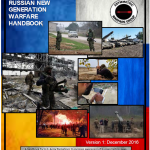 If you have picked up this handbook, or had it handed to you, you are likely an interagency team leader or team member or a military commander or civilian leader with the responsibility for setting up an interagency team. If this is your first exposure to working with the interagency, it can be a daunting prospect. This handbook is intended to provide you with a basic understanding of the interagency environment as well as insights and best practices that your team can put to use to counter irregular threats in the field or at operational level. This document continues discussion on effective targeting methods (lethal and non-lethal) at the Battalion and Brigade level. It continues dialogue on Attacking the Network by further describing Center of Gravity and Critical Vulnerability analysis themes and their link to network modeling. This document also discusses the use of detailed, Observable Indicators to focus Intelligence Surveillance and Reconnaissance assets against the enemy’s vulnerabilities. A modified Intelligence Synchronization Matrix (ISM) ensures integration and synchronization to the friendly course of action in a Counter-Insurgency environment. Using doctrinal and situational templates and a modified ISM helps the S2 understand the insurgent networks operating in his Area of Interest, focus assets against the known or suspected Critical Vulnerabilities, and synchronize ISR to give the commander the information he needs at the Decision Points.